Compliance Forge, LLC, a leading provider of premium B2B cybersecurity documentation, announces the availability of its much-anticipated cybersecurity procedures template for NIST 800-171 compliance. "Until the release of the CSOP, developing a template to provide worthwhile cybersecurity procedures has been somewhat of a 'missing link' within the cybersecurity documentation profession." ComplianceForge is once again turning heads with its B2B product line - the Cybersecurity Standardized Operating Procedures (CSOP) is currently the only enterprise-class, customizable template for cybersecurity procedures on the market. 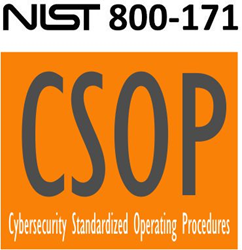 The CSOP addresses a key component for NIST 800-171 compliance, since there is a clear expectation for companies to demonstrate evidence of procedures and practices that support an effective, risk-based information security program to protect Controlled Unclassified Information (CUI). At the heart of it, the CSOP provides an organization with clear cybersecurity procedures that can scale to meet the needs and complexity of any team. The procedures are mapped to leading frameworks, so it is straightforward to have procedures that directly link to requirements, such as NIST 800-171 and NIST 800-53. (2) Help the company be audit ready through providing the appropriate evidence of procedure documentation that is expected to exist in order for a company to demonstrate that NIST 800-171 obligations are met. Given the difficult nature of writing templated procedure statements, the CSOP is approximately a "75% solution" since it is impossible to write a 100% complete cookie cutter procedure statement that can be equally applied across multiple organizations. What this means is ComplianceForge did the heavy lifting and its customers just needs to fine-tune the procedure statements with the specifics that only the customer would know to make it applicable to their organization. With the included stakeholder matrix, the CSOP helps identify the likely stakeholders for each procedure to further help organizations implement audit-ready procedures to meet NIST 800-171 obligations. ComplianceForge is a business accelerator - its focus is to provide solutions that reduce the time for businesses to meet their cybersecurity needs. Their B2B cybersecurity documentation is a fraction of the cost as compared to hiring a consultant to custom-develop documentation and are generally delivered within one business day. At a price of $2,600, purchasing the NIST 800-171 version of the CSOP from ComplianceForge is approximately 17% ($12,000+ savings) of the cost as compared to writing your own documentation and 5% ($45,000+ savings) of the cost as compared to hiring a consultant to write it for you, when you factor in internal staff time to perform reviews and refinements with key stakeholders, on top of actually researching and writing the procedure statements. The CSOP template is now available for purchase, as of November 1, 2017. For those interested in learning more, they can see an example here. For more information on the CSOP, call (855) 205-8437 or visit https://www.complianceforge.com. ComplianceForge is a specialist firm within the cybersecurity industry, with a focus is on Governance, Risk and Compliance (GRC). ComplianceForge is a Veteran-Owned Small Business (VOSB) that has been crafting leading-edge cybersecurity documentation since 2005. Their unique solutions help companies document their cybersecurity governance programs to comply with requirements such as NIST 800-171, FAR, GDPR, HIPAA and PCI DSS. ComplianceForge customers include many Fortune 500 companies within the aerospace, defense, financial and manufacturing industries.